Throughout the discourse about the needs of new residents to an area are common threads like, the need for food, shelter, and work. These elements are crucial to one’s ability to take root and thrive in a new area. Latino workers migrating to Grand Rapids settled in close proximity to spaces like Boarding Houses that could allow them access to get to work (Fernández,2013). But unique to them, was the role that language played in developing community and a sense of belonging in Grand Rapids. While it can be difficult to track the social habits of Mexican and Mexican American people in Grand Rapids in the 1930s through the 1940s due to a lack of precise documentation in census data in her article Becoming Latino: Mexican and Puerto Rican Community Formation in Grand Rapids Dr. Delia Fernández utilizes other methods such as church records, city directories, and oral histories to piece together social norms from the time that reflect the reality of Mexican and Mexican American people. This page will explore the types of social spaces that were identified in her work as well as other literature written about Latinos and Mexican Americans in this time period including From Zoot Suits to Coveralls by Elizabeth Excobedo and Corázon De Dixie by Julie Weise. 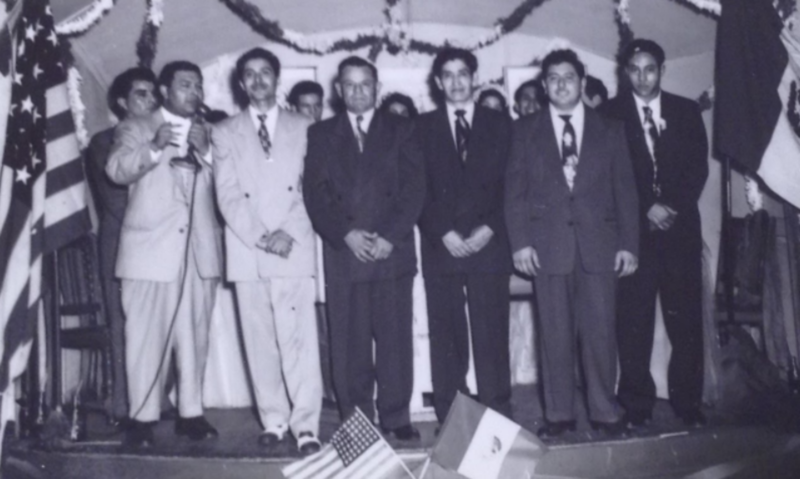 Like many other communities Mexican-American people in Grand Rapids developed relationships through there work spaces but the places wherein they developed recreational bonds require further inquiry into community specific spaces. We can find out where people spent their recreational time by looking through things like Church records and organizational documents to answer questions such as “Who was married and to whom?” “Who was a member of this church?” Information like this allows researchers to then construct and understanding how many Spanish surname people were in the area at the time and what they did to spend their leisure time. In Grand Rapids it is clear that St. Andrews Church is a major hub of community activity. Much like today, church spaces could be used for not only spiritual growth but community development as well. Churches like St. Andrews offers a regular meeting point to build relationships in service as well as through organizational programming like the potlucks and outings for new community members hosted in this space (Fernández,2013). Other spaces where people would have met each other and built relationships would likely include local restaurants, dance halls and boarding houses. These spaces had the flexibility of crafting programming specifically for the Latino and Mexican-American Communities. This type of programming is similar to that of the Latina Run USO chapter in Los Angeles that was formed during the Second World War. Latina Women, as Elizabeth Escobedo identifies in her book From Coveralls to Zoot Suits, wanted to create intentional space for Mexican-American soldiers that featured activities that would speak to them(Escobedo, 2015). In Grand Rapids the LaGrave Street’s chapel would eventually be the home of the Capilla de Nuestra Virgen De Guadalupe. Local Mexican American and Mexican folks could utilize that space for worship as well as community gatherings. While being near social opportunities such as this made socializing within one’s community accessible it was not always a choice. As in New Orleans in Church in the early 1920s According to Corázon de Dixie, as more Latinos were moving into Louisiana their Parish at the Old Mortuary Chapel was founded specifically for them to align with the separation of races in the area. Like the other two examples listed here this still maintained some benefits such as hosting Services in Both English and Spanish(Weise,2015). Escobedo, E. (n.d.). 4 Respectable Rebellions: Mexican Women and The World of Wartime Leisure. In From Coveralls to Zoot Suits: The Lives of Mexican American Women on the World War II Home Front(pp. 103-124). Chapel Hill, MI: University of North Carolina Press. “Chapter One: Mexicans as Europeans.” Corazón De Dixie: Mexicanos in the U.S. South since 1910, by Julie M. Weise, The University of North Carolina Press, 2015, pp. 14–50.